Game creators who have tried Valve's unusual new game controller tell Kotaku that the device holds a lot of promise. But make no mistake, they also say it feels pretty different from what we're used to. "We've been at Valve this week and only used it briefly, however, you immediately notice its increased responsiveness.," Sega's v.p. of PC digital distribution in the U.S. and Europe John Clark told me in an e-mail late Friday. Clark is just one of a group of game creators from studios big and small who went to the house of Half-Life, DOTA 2 and Steam and tried the third piece in Valve's three-part announcement of SteamOS, Steam Machine and Steam Controller. All three components will combine to present Valve's push into living room gaming where they and the library of PC-based Steam games will presumably bump into the likes of Sony, Microsoft and Nintendo. The controller is key, of course. And while Valve says it is hackable, it will likely be defined by certain core features that set it apart from both mouse-and-keyboard and traditional controllers like that of the Xbox 360. It eschews twin control sticks for circular trackpads that are equipped to deliver some haptic (force) feedback. It moves the traditional AXBY face buttons to the center of the controller, all four surrounding a small touchscreen. Beta controllers, including the one pictured at the top of this post in a photo supplied by Clark, don't include the touch screen and have temporary face buttons in the screen's place. Clark and his colleague, Jurgen Post, COO and president of Sega Europe had recently visited Valve to try the controller and stuck around for a couple of days with teams of Sega developers from real-time-strategy studios Relic (Company of Heroes) and Creative Assembly (Total War). Indie developer Ichiro Lambe of Dejobaan Games also tried the controller and gamely tried to explain to me (and you) what the device's trackpads feel like. "It's tough to grok the touch feedback until you try it out," he said in an e-mail. "You pick it up, and, for the first few minutes, you're mostly just moving your thumbs over the trackpads and marveling at what you're feeling." Lambe had played a first-person shooter with Valve's new device. It seems that the haptic feedback of the trackpads made a big impression. The idea of that feedback is that it's supposed to create the feeling that the trackpad has edges on it, perhaps the outlines of buttons, if that's how it is programmed for a specific game. Those trackpads are sensitive to movement and pressure. "This sounds weird, but it's almost like rolling two weighted trackballs that are too large to actually fit into the controller," Lambe said as he tried to explain what it's like to have one's thumbs on those two trackpads. "For camera controls, slide one thumb to the right, and you'll feel this ticking, like you're turning a physical control. Flick your thumb quickly, and this imaginary physical thing reacts like something with weight to it—the 'trackball' continues to roll for a bit, eventually coming to a rest. And since it's all controlled through the software, the same trackpad then becomes more like a mouse or a laptop trackpad when you're navigating through menus. Dynamic!" 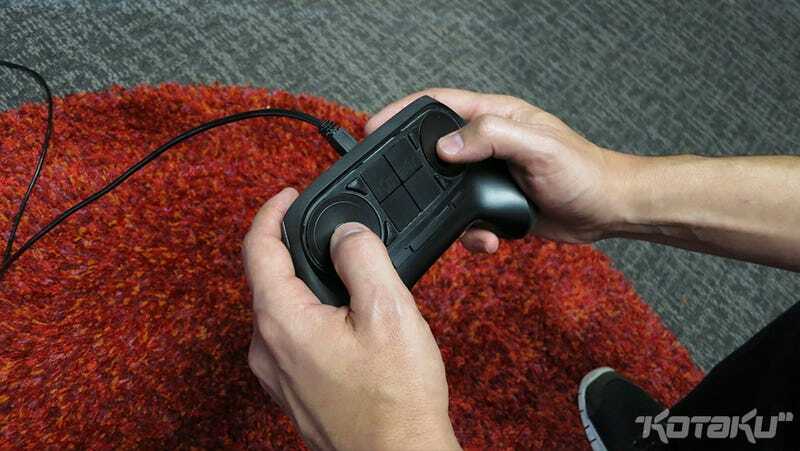 I received similar positive impressions of the controller's haptic feedback from Klei's Jamie Cheng who had not gone hands-on with the controller but whose colleague had. "He told us that the controller haptic feedback was uncanny," Cheng said, "and that using the trackpad really did feel like pressing buttons." I had asked Lambe how the Steam controller felt compared to traditional game controllers. He replied: "It's familiar enough to be accessible (I believe they tried less conventional designs before they went with a form factor similar to existing gamepads), but much more precise for (say) anything WASD+mouselook." Valve's Steam controller, Lambe added, "makes FPS gaming more comfortable in a gamepad form factor, and translates other genres (anything where you'd need precise mouse control for gameplay or user interface) to the living room." If Lambe was a good tester for first-person games, Team Meat's Tommy Refenes was an ideal candidate for seeing how responsive the Valve controller was to classic 2D action games. Refenes tried his and Edmund McMillen's own Super Meat Boy along with Mossmouth's Spelunky with the new controller. Refenes blogged about his experiences, summarizing them thusly: "TL;DR; Great Start, needs some improvements, but I could play any game I wanted with it just fine." He had said as much to me over e-mail: "I went into it as 'I'm going to play this like an Xbox and see how it does.' In that way it did pretty well." I was able to play Meat Boy the way Meat Boy can be played on an advanced level (and I’m rusty at it). The right circle button was the jump button and we had both Triggers mapped to the Run button just like a regular Xbox 360 controller. We also had the Run button mapped to the back trigger buttons I mentioned before that can be pressed with your fingers on the back of the pad. This worked great but did lead to a bit of hand cramping. I think this is due more to the way you use the run button in Meat Boy and not the design of the controller or the buttons. Spelunky requires Whip, Jump, Bomb, and Rope buttons. We configured the controller to play like an Xbox controller. So the left circle pad was once again used for the directional buttons, and the right circle pad was used as A, B, X, Y buttons in the orientation that you find on an Xbox Controller....I played through Spelunky and the controller worked great. As I was playing I was describing to the engineers the twitch movements that go into Spelunky... The Steam controller handled this just fine. Refenes said he found himself yearning for a little more physical feedback from the trackpads and discussed an idea with Valve's engineers involving adding physical nubs to the pads "that would be noticeable enough where your thumbs would find them, but not so abrasive that the circle pads couldn’t comfortably used in mouse / trackpad mode came." He seemed to think that the idea, already considered by Valve, might be tested with newer iterations of the controller. Refenes said he still prefers the Xbox 360 controller for now, somewhat due to familiarity, but said he could be happy gaming just on the Steam controller. He won't be the only person, though, who will consider the controller in comparison to the traditional twinstick 360 or even PS3 gamepad. Dejobaan's Lambe expressed some warmth for the familiar as well. "There's something satisfying about moving a physical stick or depressing a button with some resistance and throw," he said. "The immediate feedback that an analog stick gives you when you reach the extreme of a direction is useful. But how much of that is just a matter of what we're used to?" A Valve rep indicated to me that other developers have also tried the controller, including indie PC strategy game publisher Paradox Interactive and Hitman studio IO Interactive. The diversity of developers indicates that Valve expects its unusual new controller to be versatile. Consider, after all, that the Sega guys who checked out the controller specialize in mouse-and-keyboard strategy games. "We'd really like to see how the developers experiment with PC RTS titles [with the new controller] and will value their feedback throughout the beta," Sega's Post told me over e-mail. "Games such as Company of Heroes 2 and Rome II are core for Sega and of course, you would define them as mouse & keyboard games. I'm personally intrigued to see how these games could work with the controller." Valve's hardware beta for its controller and its Steam Machine gaming devices will begin soon, with an expected release to consumers next year. The controller will raise plenty more questions in the months to come. As it is used and as it evolves, we'll bring you answers.